Home C: Opinion For GOP candidates the question is: To Trump or not to Trump? For GOP candidates the question is: To Trump or not to Trump? Jun 16th, 2018 · Comments Off on For GOP candidates the question is: To Trump or not to Trump? With summer bearing down on us (finally! ), it seemed like a good idea to take one quick snap shot of the local political scene before moving into our summer hiatus (and yes, we already skipped an edition of Politics as Unusual (PAU), sensing something of a politics overload for you, the reader). As this could well be the final edition of PAU until — gasp — August, it’s a good time to take inventory of the local political situation before everyone bails for the beach (or in my case, Cuba — ¡Hola, Comrades!). The situation appears to be this right now, heading into this fall: If you’re a Republican, you’re with President Donald Trump, or you’re about to be out of work. If you’re a Democrat, you’re really happy about that. To survive primaries, GOP candidates have all but been required to take an oath of personal loyalty to the president — or face the wrath of the Republican primary voter. Problem is, though, that those primary voters will likely be a lot less than 40% of the November electorate, which creates a math problem for GOP candidates. Do they continue their praise for Trump and pray that Robert Mueller’s investigation shows no wrongdoing? Or do they start to edge away and hope to attract moderate Republicans, independents and conservative Democrats? Either course is problematic — no one needs to get Twitter bashed by the President, which increasingly is becoming the kiss of death. But polling suggests some 60% of voters want a check on Trump. Also, while Democrats have been disorganized and completely unable to come up with a message beyond “Trump, bad” — both the Trump Administration and Republicans have done an awesome job of just handing out slam dunk issues to their Democratic friends, like free samples at Costco. First off, the tax cut is proving to be, well, not so great for the average joe. It’s ballooning up the deficit, which has to concern fiscal conservatives, without sparking significant wage or job growth. The only winners right now seem to be Wall Street — where we’re seeing a record number of stock buybacks by corporations. Republicans hoped to be able to run on the cut — but if anything it seems to be a negative among voters right now. Still, were that the only issue, GOP candidates would probably still be in good shape, given their structural and financial advantages. But…..the images of immigrant/refugee families being torn apart and kids being kept in cages are especially bad visuals. While Americans may well disagree about the flow of people coming in across the border, as a group, we’re not cruel and have a particularly soft spot for kids. The current Trump Administration policy just comes across as mean — and could prove an anchor to Lou Barletta’s already long-shot run at U.S. Senator Bob Casey Jr. Despite the fact that polling suggests that health care is right at the top of the list of voter concerns this year, the Trump Justice Department is no longer defending the Affordable Care Act — and specifically the provision requiring coverage for pre-existing conditions. That one provision is probably the single most popular portion of the hotly debated law. The removal of the provision would hit voters over 50 hardest — the sweet spot of the GOP coalition, driving at least some to vote Democratic in anger, or just not show up in November. With virtually no help from Democrats, Republicans seem to have branded themselves as the “Party of Mean” — an unforced error that has to have party elders concerned. According to the moving average of polls at FiveThirdEight.com, Democrats currently hold about an eight-point advantage in the generic Congressional poll (and even when you saw headlines earlier this year that race was even or had Republicans leading, the aggregate polling never showed the race as being closer than four points, with Democrats ahead). Keep in mind, the national media almost always wants a horse race (2016 was a rare exception), a story to tell with drama, to attract eyeballs. An eight-point margin means the Democrats will very likely take control of the U.S. House of Representatives (including at least three seats in southeast Pennsylvania, including Chester County’s 6th) and at least keep the U.S. Senate close. And, barring some bizarre development (always a possibility in this era), that number will probably hold steady until Labor Day. But when folks reengage in the fall and take stock, which way the number breaks could give us clues as to how the November election will go. Meanwhile, it is another set of numbers that have the Tom Wolf campaign all grins and the Scott Wagner campaign crying foul. The largely reputable Franklin & Marshall poll came out this week, showing Wagner trailing Wolf 48%-29%, a 19-point deficit in the governor’s race. That largely tracks with the March numbers, showing Wolf with a 17-point lead of 38%-21%. The same poll showed Barletta trailing Casey 44-27 in the U.S. Senate campaign. Wagner’s campaign immediately ripped into the poll numbers (further underlining the recent GOP strategy of when in doubt, be angry about everything), suggesting with some validity that Democrats were oversampled. Wagner’s campaign ripped into the idea that Democrats would turn out at a rate of 9 points higher than Republicans this fall, which admittedly seems unlikely. Based on recent history, that number is probably too high and likely skewed the numbers in favor of Wolf and Casey. Wagner’s campaign then cited a poll — likely one as flawed or more flawed — from McLaughlin and Associates, suggesting the race is within 7 points. McLaughlin used a very optimistic (for Republicans) likely voter model. In terms of real world numbers, if you work back to the raw numbers from both polls and predict about a 4% Democratic turnout advantage (which I think is a bit light — 6% seems right at this point), the race is likely in the 11-12 point range as a best case scenario for Republicans. The big variable? Republican turnout and performance. Getting moderates to turn out at all. Keep in mind, enough Chester County Republicans found Trump so unpalatable that they actually voted for Hillary Clinton, which is why Clinton won the county by nearly 10 points, just four years after Mitt Romney narrowly defeated President Barack Obama in the county. Will GOP moderates be so frustrated and unhappy with Wagner and Barletta — both of whom are aggressive Trump supporters — that they just stay home on election day? It’s very hard to model right now. Worse, potentially, for Republicans: will the moderates, deeply frustrated with how things are going come out and vote — and vote for Democrats to send a message to their party? In the numerous special elections around the country so far this year, it seems like this has been a factor in a number of Democratic wins in Republican areas. Difficult to model, too, because frankly so much can happen between now and November. In terms of ripping into Franklin & Marshall — one can certainly take issue with some of the modeling calls they made. But no more so than the McLaughlin poll — on the surface there might well be better arguments for the model F&M used than that of McLaughlin. Additionally, according to FiveThirtyEight.com — home for us stat/polling geeks — Franklin & Marshall is graded as a B- pollster, typically pretty good and within the margin of error 84 percent of the time with a slight Democratic lean (0.1%). 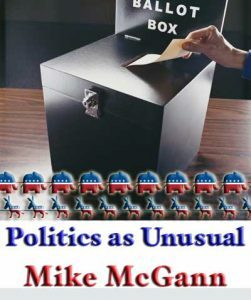 McLaughlin, meanwhile, is rated as C-, accurate 77% of the time and has a 0.4% Republican lean. Another key factor: McLaughlin doesn’t poll cell phones for polling, while F&M does — meaning that McLaughlin tends to miss younger, and typically more Democratic voters. So, yes, can the Wagner campaign make an argument that they disagree with the poll’s methodology? Of course. Is it right to call it “phony?” No. And honestly, the Wagner campaign ought to dig deeper into the numbers to see some stuff that indicates much bigger concerns. According to the F&M poll, 30% of Republicans polled are undecided, while 15% support Wolf — here, you can’t argue a sample error or turnout projection modeling problem. The poll suggests that Wagner has, at best, lukewarm support in his own party. Additionally, Wagner trails Wolf 45-30 among independents. Barletta’s numbers are slightly better, but not much. Additionally, the poll suggests that Wagner is trailing Wolf 62-14 in the Philadelphia and 49-28 in the collar counties (which underlines the issue of getting support from moderate, suburban Republican voters). Philly and the five collar counties are a giant hunk of the gross vote in the state (Wagner also trails Wolf 72-7 in Allegheny County). Even if you knock 10 points off each number to account for sample error, that’s a massive differential in gross vote count. To be blunt, if the election day numbers are anything like that (even accounting for 10 points of error) there aren’t enough votes in the rest of the state to make it up, even if Wagner were wildly ahead in all of the other regions. Spoiler alert: he’s not. In many ways, the Wagner-Wolf numbers look worse than Rendell-Swann in 2006 — Rendell won by 20 points that year, which also featured a Democratic wave, with electoral atmospherics similar but maybe not as bad for Republicans as currently seen, not to mention that Swann’s name ID was much, much better than Wagner’s currently is. And spin or not, that’s not phony — but should be a real concern for GOP candidates down ballot. Lastly, to all the dads out there: have a great Father’s Day.